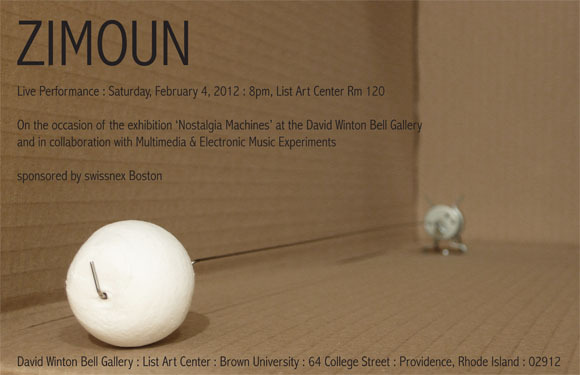 On Saturday, 4 February 2012, world-renowned sound and installation artist Zimoun will give a special live performance at Brown University’s List Art Center as part of the exhibition Nostalgia Machines at the David Winton Bell Gallery. This event is co-produced by the David Winton Bell Gallery and Multimedia & Electronic Music Experiments and is sponsored by swissnex Boston. Zimoun : Compilation Video V.2.9 | Sound Sculptures & Installations, Sound Architectures from STUDIO ZIMOUN on Vimeo.